This usually means a footballer has had a particularly good game one day to the extent the opposition couldn’t get near him. Yet nobody is actually unplayable. Not really. At his pomp, the great Brazilian Ronaldinho came close when he was the undisputed best player on the planet. One memorable performance brought him two goals in El Classico at the Bernebeu. The Real Madrid fans gave him a standing ovation. Lionel Messi and Cristiano Ronaldo have enjoyed games in which you begin to wonder if they are playing a different game to one another, but even the very best can be tamed, by fair means or foul. Then there is Andy Carroll who was linked, rather vaguely it must be said, with a move back home to Newcastle United at the weekend. There have been times when the Geordie has been as unplayable a centre-forward as currently exists in English football, with perhaps the exception of the now departed Luis Suarez. 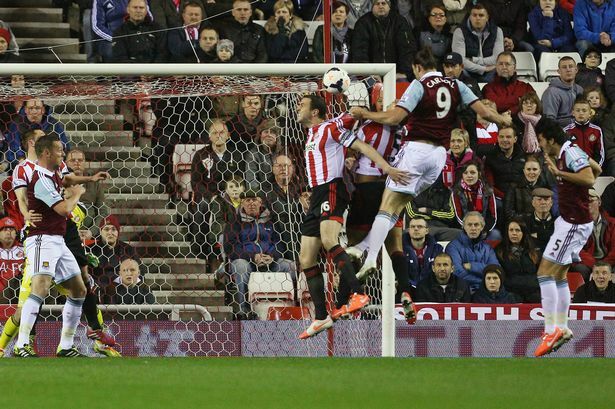 At the Stadium of Light in March, for example, Carroll performed like a man possessed. He bullied John O’Shea and Wes Brown, two fine defenders who know how to handle themselves. Every ball was controlled in an instant and then played to a team-mate, Carroll them tearing into the Sunderland box hungry to get on the edge of a cross. Which he did after ten minutes when he bludgeoned his way through two defenders to head home a goal. “There were a few games last season when he was devastating (Sunderland) and against Swansea when he set up both of Kevin Nolan’s goals;” said West Ham United chairman David Sullivan when asked about his favourite player at the club this week. Sullivan is right. There were a few games. Just a few, mind. When Carroll is fit and has a decent run of matches behind him, is injury free and feels good about himself and the team is primarily set up to arm him with cross balls, then the guy takes some stopping. Yet you are asking for an awful lot to happen at the same time if Carroll is going to be your main striker for an entire season. That is why Newcastle United should not contemplate attempting to sign their former man, even if Alan Pardew is tempted to ask Mike Ashley to spend at least £12m, it could easily be more, on a centre-forward who has scored just 19 domestic goals since leaving St James’ Park in January 2011. A disclaimer is needed before we move on. I really like Carroll as a player. People who know him say he is an interesting character who likes a laugh, is laid-back to the point of being horizontal and can give the impression he’s other worldy. Nothing wrong with that. I like a footballer with a bit of personality about him – but that doesn’t mean Carroll and Newcastle United should get back together. First things first. Like so many centre-forwards of his size, injury and fitness are always going to be an issue. Think back to Duncan Ferguson, John Hartson and Niall Quinn. All of them were great on their day. The problem being their days were followed too often by long periods of recuperation. Although, by all accounts, Carroll has worked incredibly hard over the summer to ensure he is fully fit again. As Sullivan revealed: “I still think Andy will come good. He didn’t have a pre-season last year. So let’s hold off judging how his body is until the first few months of the upcoming Premier League campaign. However, even if Carroll is 100 per cent and capable of playing 40-plus games over ten months, this Newcastle team doesn’t have room to accommodate such a player. Have Remy Cabella and Siem de Jong been bought to lump high balls into the box? You’ve got to hope not and I don’t believe for a second that’s entered the manager’s mind. As much as Pardew likes Carroll, when you see the type who have been brought in this summer none are geared up for playing off a big man. While I don’t have a list of all De Jong’s former team-mates, it’s safe to assume at Ajax he wasn’t asked once to punt the ball and then go chasing in the hope of getting on the end of a header. Given that the Dutchman is going to be the creative focal point of Newcastle, what is the point is making him play such an unfamiliar game? If you are going to have Carroll in your team, the team must play to his strengths. That’s why West Ham play a long-ball style. It’s why West Ham fans don’t like Sam Allardyce. The Newcastle-Carroll stories will never go away. Some will have more substance to them than others. Yet as we stand, Newcastle are going in another direction than having Carroll back as their No 9.